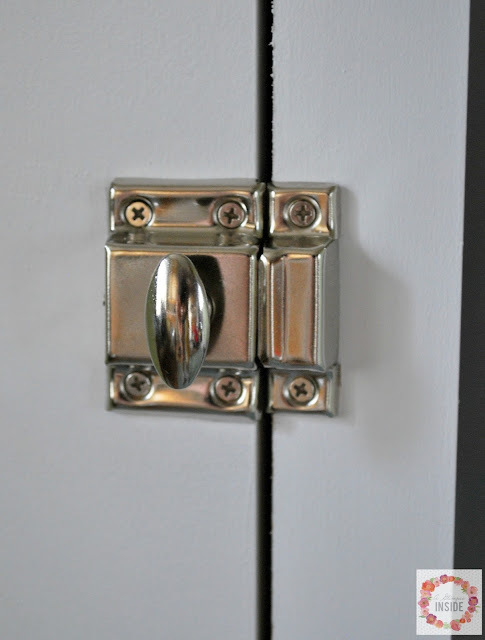 I have another house update for you today, yay!! 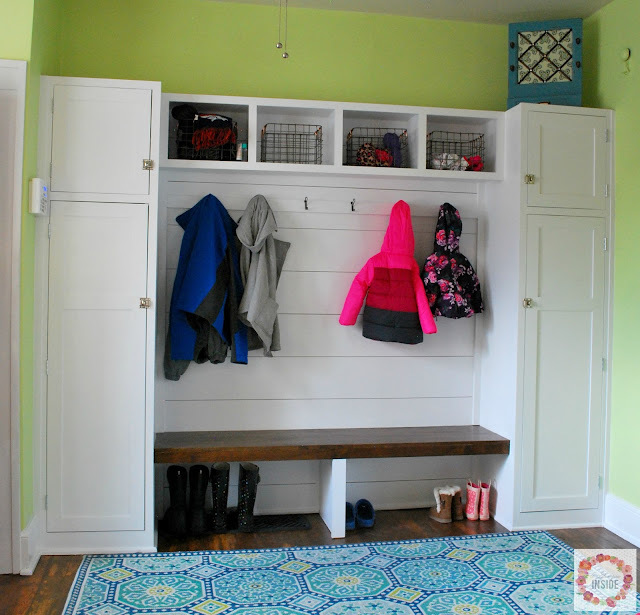 You know how I was complaining that if the sun would just come out long enough, I would take pictures of the mudroom we completed back in November to share with you? Well, the sun finally came out! So here is our new mudroom addition. 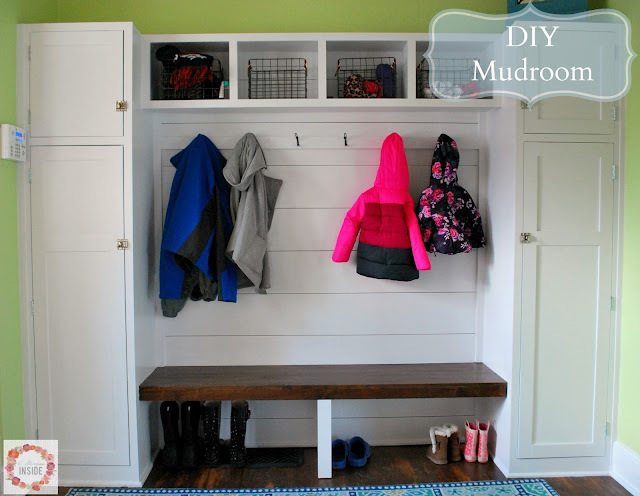 Every since we toured the house when we were looking to buy one, we knew that we would build a mudroom area in this location. Here is the house the day we closed on it. As you can see it was like an olive green color on the walls. This was the original kitchen of the house before the previous owner added the huge kitchen addition. The original kitchen cabinets and counters are still on the left side of the room flanking the entrance into the "now" kitchen and then the right side of the room was one giant blank wall which was where the appliances used to sit in the old kitchen. 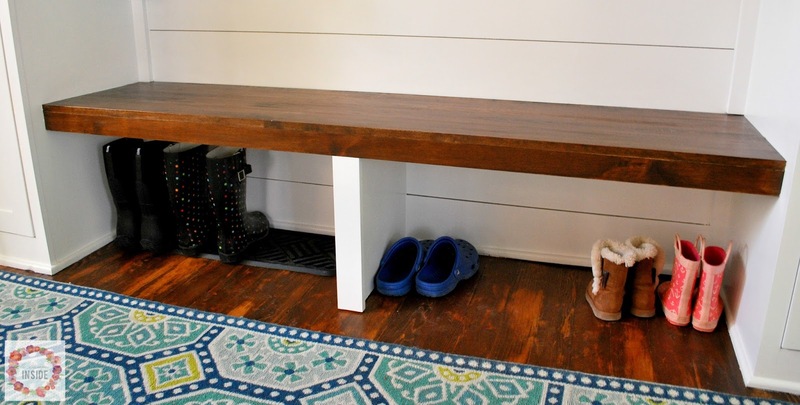 The closed door in the back leads to the stairwell that goes to the basements and to the door that heads out to our driveway and garage so this is the perfect location to drop your boots, coats, and hats coming in from the cold. My parents arrived here at the end of October for a week visit. 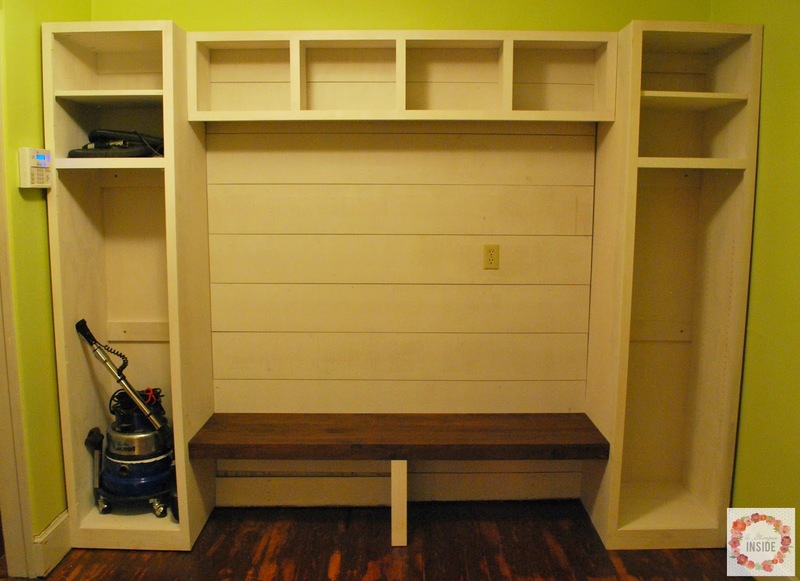 They asked what they could help us with and we joked that we can do the mudroom. Well, that joked turned serious by that evening and my dad drew up detailed plans and him and I were at Home Depot the next 3 days in a row. While my dad was in the workroom in our basement, my mom was upstairs sanding the floors of the mudroom. 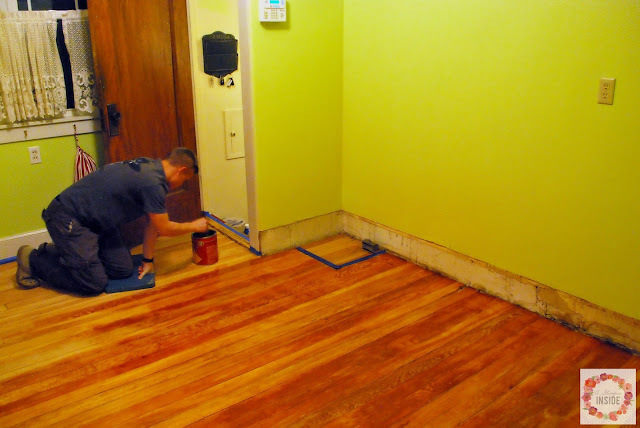 Here is Travis adding the floor conditioner to the floor before I came through and stained them. I stained the floors the same as the rest of the house. They turned out rather blotchy, as you can see, because after being 110 yrs old, they aren't exactly flat boards anymore AND we only used palm sanders to sand them. 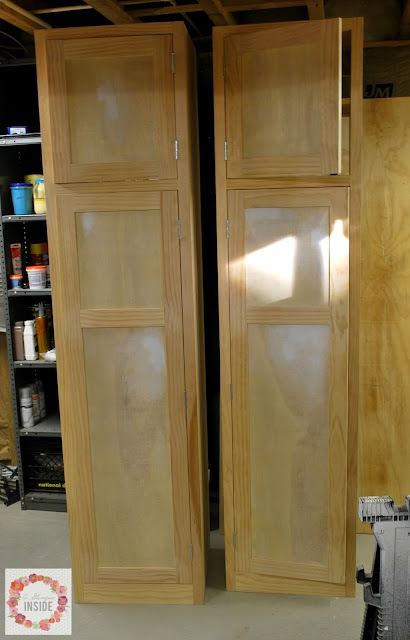 Travis and I talked- do I sand and try to add another coat of stain or could we live with them? I touched up a few spots and then decided that we were happy with them. They feel like they were in a factory or something at one time and we liked the look, plus I knew I had a rug to go over them. 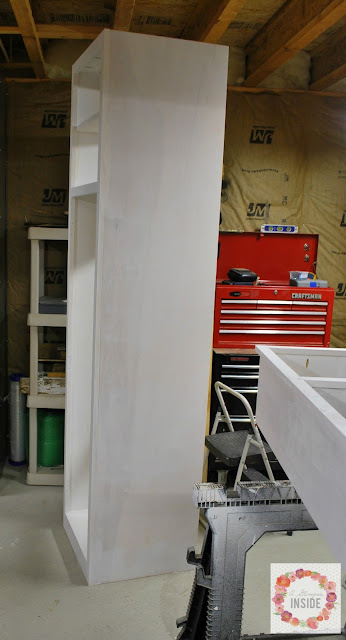 As you can see, we left the corners of the floor where the cabinets would be unstained. We first did this because we were ONLY going to sand the floor and then install the built in but we decided let just get it done so we did. You won't see that it is unstained anyways. As I previously said, my dad built the entire thing downstairs. All the cabinets, bench, doors, cubbies, were built in the basement workroom. This was the bench all together. Then things got real. Floors were done so my mom, dad, Travis, and I all quickly primed everything in the basement before taking it up to install. 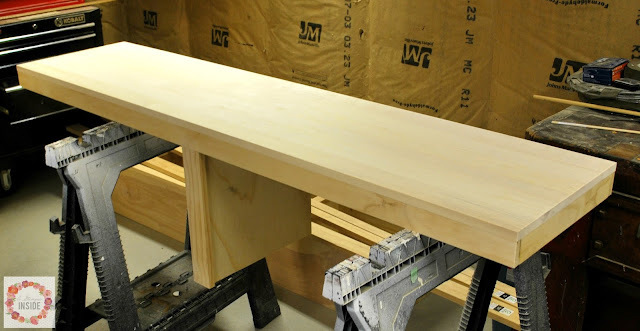 I also stained the bench before installing it. 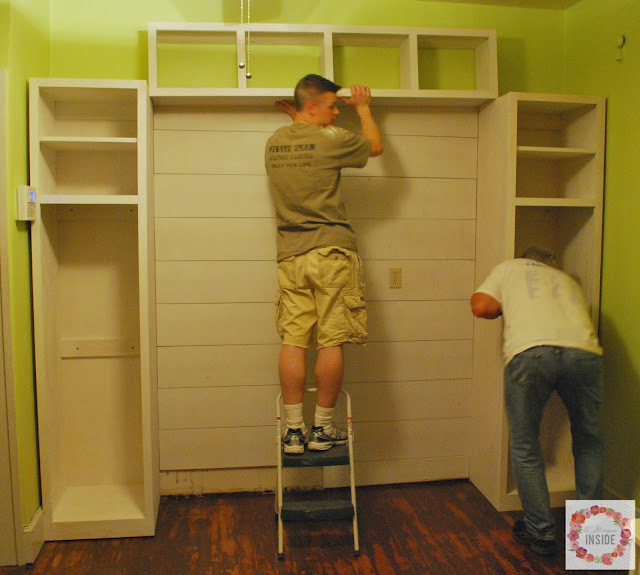 The installation began by installing the planks on the wall that sit between the two large cabinets. 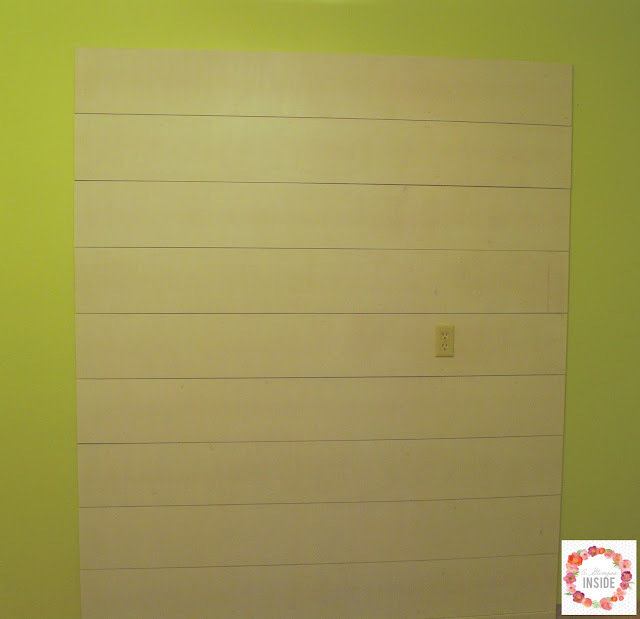 We opted to do larger boards, the size of shiplap, instead of smaller planks. These were created using MDF that we had Home Depot cut into the width that we needed. The two side cabinets were installed next, followed by the cubbies on top. This was no easy feat when dealing with a house that is 110 yrs old and not having a single straight, level surface in the entire house, but we got them in successfully! The bench was installed last and it came together perfectly. This was all installed the night before my parents left and then it kinda sat this way for a week or two. Travis and I then added small pieces of wood down the side of the center to cover any gaps that were left between the cabinets and the planks. We also placed a board through the center for the hooks. 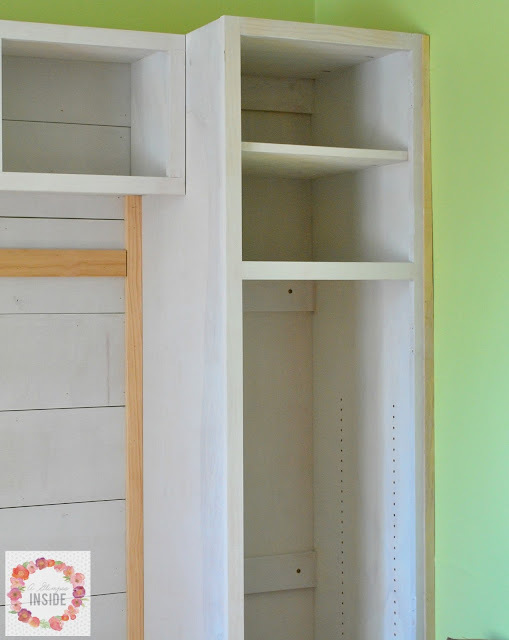 We didn't want to place the hooks in just the MDF because they may pull out. 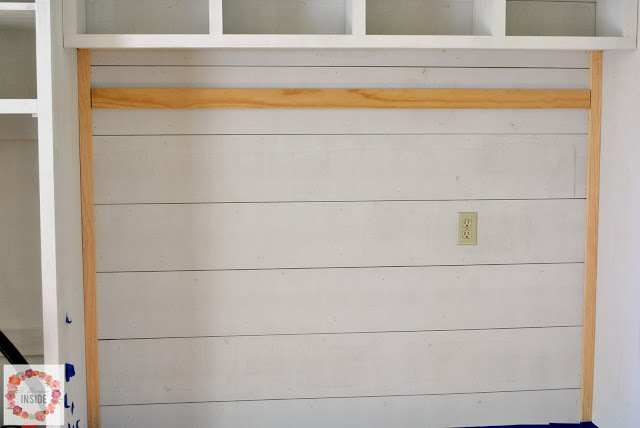 We also placed a small piece of wood on the face of the cabinets along the walls. Like I previously stated, this house is no way straight or level, so we had a gap that changed widths so we just covered it up cutting the wood to match the wall. And then this sat like this again. I knew I was going to be the one that would be caulking, filling holes, and painting the entire thing that I wasn't in the mood to tackle it. I finally got things kicked into gear before Thanksgiving and finished it! I polyed the bench and I painted the entire thing, twice, with ultra white paint. I used the same stain on the bench as we've used on the floor. Under the bench there is room to store some of our shoes and boots. There are 4 cubbies along the top, one for each of us. And since taking these pictures I added little chalkboard signs to each basket, each with the first initial of the owner's name on it. 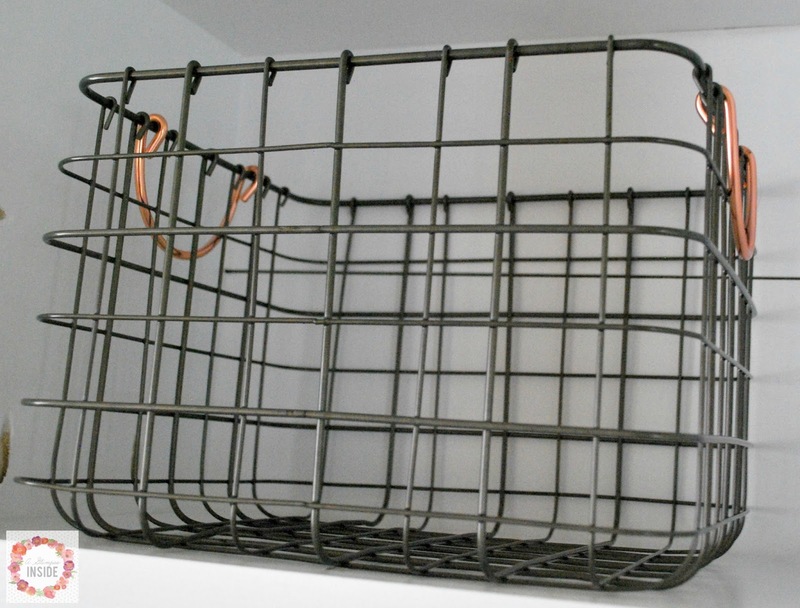 I found these wire baskets at Target to use in the cubbies to hold our winter hats, gloves, whatever. 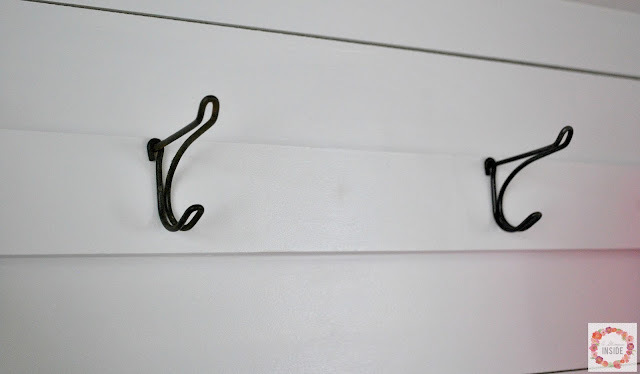 These hooks are literally ALL OVER our house. Whoever bought them must have gotten a deal on them but we love them. They are bent metal into the hook shapes. We used 6 along the board for a place for our coats. I bought these door latches that you would see on Hoosiers or Ice Boxes from D. Lawless and I LOVE them!! If you look at the original cabinets from the old kitchen, you can tell that this was what used to be on them originally so it was no question this is what I had to buy. I even bought enough to put them back on the old cabinets too. Onto the inside of the cabinets. 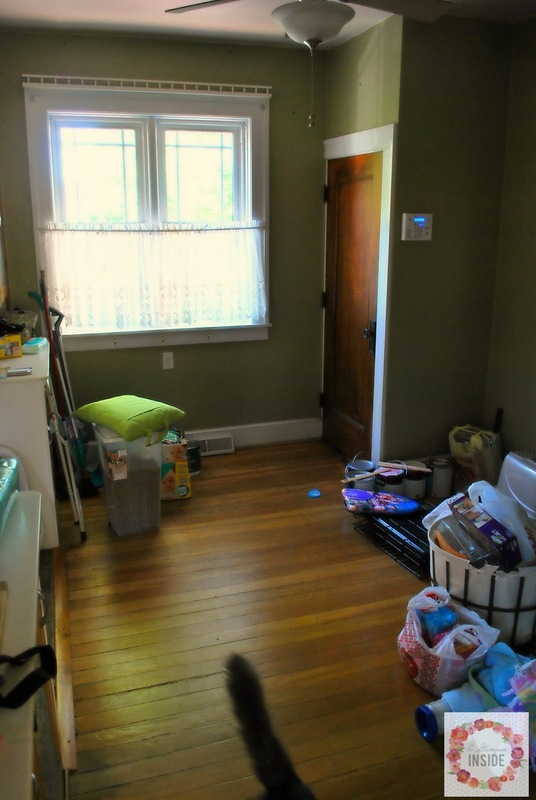 We have a large vacuum and had no place to store it since we took away the closet in the living room to open that wall up to the front door and stairs, so the left cabinets is just a big open cabinet for our vacuum and a few other mops and brooms. 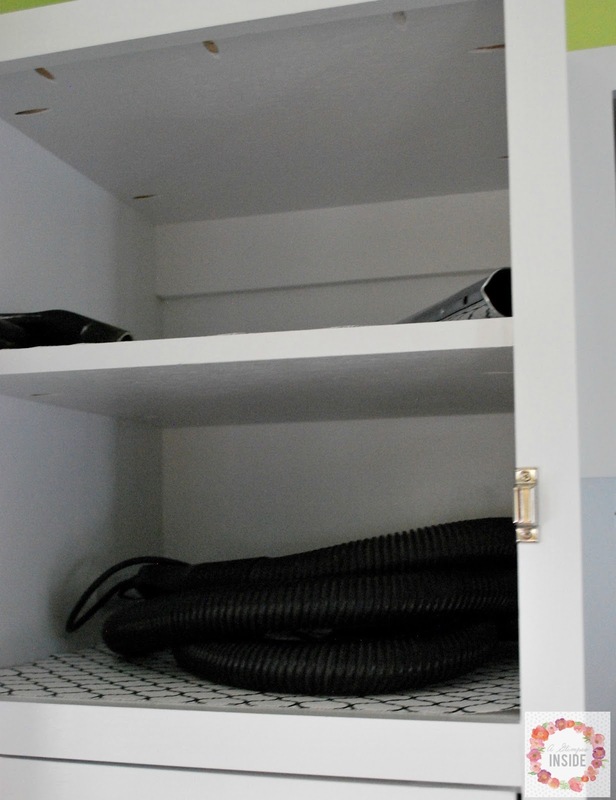 The small top cabinet has a fixed shelf and I currently store the extra parts to our vacuum. The right cabinet I wanted for storage like cleaners, paper towel, whatever else, so it has adjustable shelves in it. 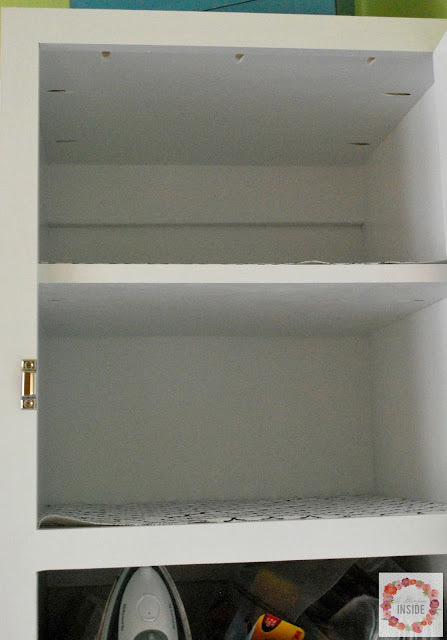 Then the small cabinet on top is just like the left side, with a fixed shelf. It sure adds a lot of great storage!! As you can see we painted the dark olive green walls to a bright, almost granny smith apple green and it made the room so much brighter! I found this awesome green, teal blue, and white rug on Target and snagged it for a great deal. I am still debating on how I am going to decorate the area up top. I just put that mail center on top to throw something up there but it won't stay there. We love having this area complete! It is definitely worth it and we are so thrilled my parents came and helped create this space for us in a whirlwind week! NOW, I need to get my act together and paint the original cabinets on the other side of the room for this space to REALLY be complete! It'll will happen... eventually! Big job and looks GREAT. Wonderful storage. Lovely mudroom! A must have with children. 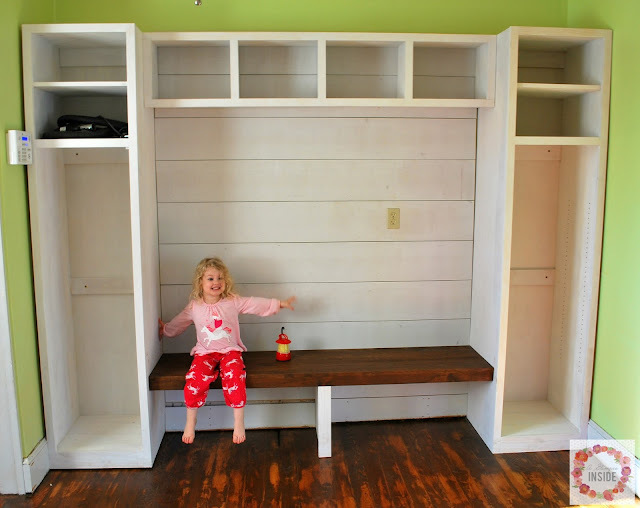 Always had a "make shift" mudroom in all of our houses. Kudos to the men for such a great job! I love the floor all rustic. How awesome an "antique"house.Have such character, not like the cookie cutter house we have here. What a blessing! !